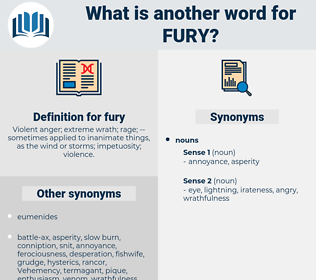 What is another word for fury? Violent anger; extreme wrath; rage; -- sometimes applied to inanimate things, as the wind or storms; impetuosity; violence. happiness, inability, glee, calm, powerlessness, kindness, lethargy, weakness, inactivity, peace, calmness, laziness, incompetence, peacefulness, mildness. gentleness, leniency, forbearance, placidity, long-suffering, charity, lenity, self-control, still, restfulness, repose, love, peaceableness, amiability, Tranquilness, quiet, self-restraint, delight, Sereneness, serenity. Oh I never saw anybody in such a fury as he put himself into! Why, no, then, she replied; and if ever a man left in a fury he did.